Alex: “My husband and I had a pretty busy and rocky end to 2015, and so we wanted to take a trip that would be just the two of us and full of fun! 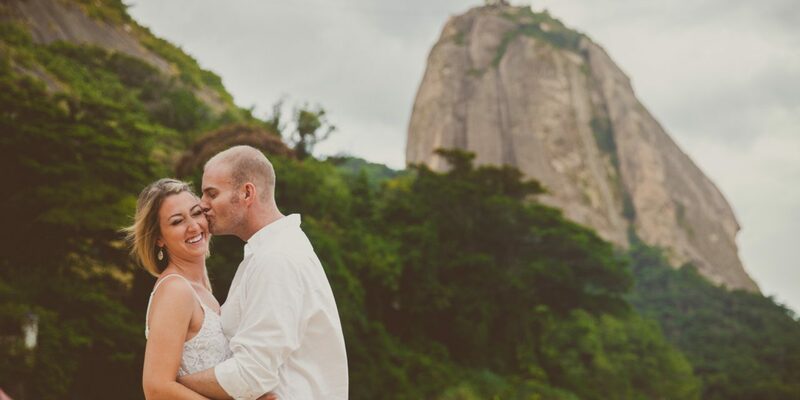 We chose Rio de Janeiro, Brazil as Jim is very active and Rio seemed to encompass what he loves: sun, surfing, sports, and water. Our favorite memory from the trip is paragliding off the side of a huge cliff overlooking Rio. It was absolutely terrifying, but after we landed we were so glad we did it. Nothing like conquering fears on vacation! We also spent New Years’ Eve on Copacabana Beach with over a million other people, all wearing white. At midnight, we ran into the ocean to watch the fireworks from the sea. So awesome! “You must go to a Brazilian steakhouse, of course, but there is so much more to explore than just the all-you-can-eat steak buffet. Zaza Bistro in Ipanema was out of this world, as was La Carioca Cevicheria, for those raw fish lovers. My husband and I grabbed appetizers and caipirinhas at the infamous Belmond Copacabana Palace after our Flytographer shoot. We just drank and talked for hours while listening to Brazilian music, including ‘The Girl from Ipanema.’ It was just lovely, and I highly recommend an early evening there. A favela tour is a must. We walked through the largest favela in Rio, Rocinha, and visited an after-school program in Vila Canoas. The tour, operated by Favela Tour, allowed us to experience a different part of Rio de Janeiro and provided us with insight into how millions of cariocas live and work in the city. Finally, catch the sunset from Ipanema Beach at least once, or maybe two or three times! Looking to capture your next adventure?